So putting together the NT 4x8 trailer. Impossible to get square but got it close. Attached the brackets in the middle where it folds realizing that I don't want it folding because it's going to mess with the wall placement. (I couldn't drop the outer part over the frame an inch) Should I remove those brackets and attach the bolts through the crossmembers to make it non foldable? If that makes sense. Nowhere in the directions does it tell me how to make it non folding. Also, is it super important to move the axle back to 40" from the rear? We plan on a tongue box in front and stowage inside of the teardrop towards the front. I'd think keeping the axle where it normally is would be a good thing? dsotto wrote: Also, is it super important to move the axle back to 40" from the rear? 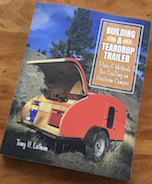 We plan on a tongue box in front and stowage inside of the teardrop towards the front. I'd think keeping the axle where it normally is would be a good thing? You probably need to move it back (anyway) to allow the door to open. The door should be located so when you sit up, your hip is right next to it and you can pivot and step out. Dang. I'm afraid of messing it up. Is there a tutorial on how to mod it to be non folding and everything? And directions on how to move the axle? I really should've spent the money to get one made.. but my budget was a bit tight for that. Is your camper going to be 4x8 or bigger? Kim Armstrong wrote: Is your camper going to be 4x8 or bigger? Here's a 5x8 Northern Tool trailer, with the axle in the stock position, and a tongue box. It tows beautifully and I find the door to be in just the right spot. I've since installed larger tires and fenders as well. Just my 2 cents. I didn't move the axle when I built on a HF frame, I didn't have any problems with the doors.